BetaNews have tested the IE9 preview vesion today. Configure :Vista SP2 platform . 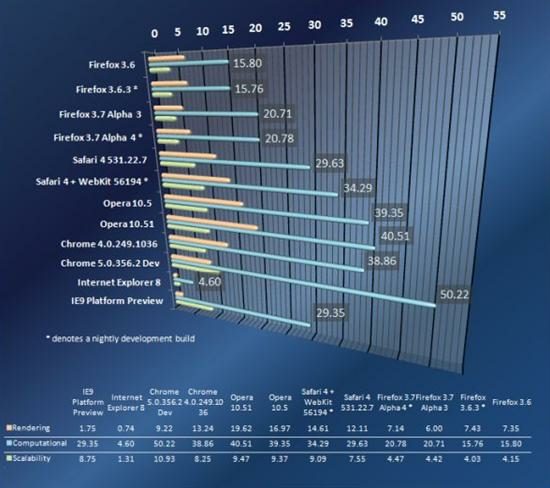 Let look at the result below: IE9 is with a good performance ,6 times than IE8 , 13 times than IE7 .But it still slower than Chome5 and Opera10.5 . 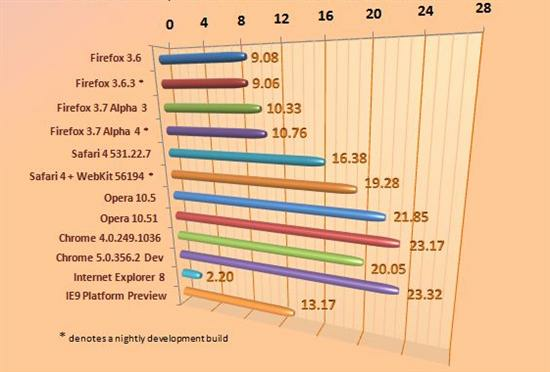 Comparing to IE family ,IE9 is a really revolution ,not only support new CSS standard ,and new HTML technology ,but also support GPU acceleration , the further development of art-of-state browser. With GPU acceleration , 3D online web-based Game will be possible , and also provide a better animation for a better UI and user experience .That`s really awsome. IE9 will be a good new for web developers ,but its not a system-preinstalled web browser , so how to promote the new browser is also a big tough for Microsoft .Can Microsoft give those developers who sucked at compatibility a really good news? Welcome to my magic world.